In today’s context, where African Americans are considered fully human and contributing citizens to the American democracy, it is imperative that the fundamental tenets of religious freedom as an inalienable and human right be affirmed. Most Americans — including religious and civic leaders, as well as religious liberty advocates — fail to critically reflect on the implications of religious freedom for African Americans between the 1600s and now. Last week changed the course of history when 35 students from five Historically Black Theological Institutions (Hood Theological Seminary, Howard University School of Divinity, Interdenominational Theological Seminary, Payne Theological Seminary and the Samuel DeWitt Proctor School of Theology at Virginia Union University) enrolled in the Religious Freedom Center’s African Americans and Religious Freedom course. This intensive course was designed for graduate seminary students to critically engage the contentious politics of race and religious freedom in American public life. Particular attention was given to how and in what ways power, violence, identity and pluralism form and frame the discourse of religious freedom across time and space. In today’s context, where African Americans are considered fully human and contributing citizens to the American democracy, it is imperative that the fundamental tenets of religious freedom as an inalienable and human right be affirmed and recognized. Through every presentation and ritual, these expectations were met as the lecturers empowered and equipped students with counternarratives to what has been adopted into the larger American story. Overall, this three-year project “Religious Freedom: African American Perspectives,” funded by the Henry Luce Foundation, reminds some and informs others that conversations centering on African Americans of any religious group should no longer overlook racially-motivated infractions in our places of worship without consideration of our rights to religious freedom. The colonization and enslavement of Africans is more than a blemish on America’s complicated history; it is thread that quilted the fabric of exclusion and dehumanization. 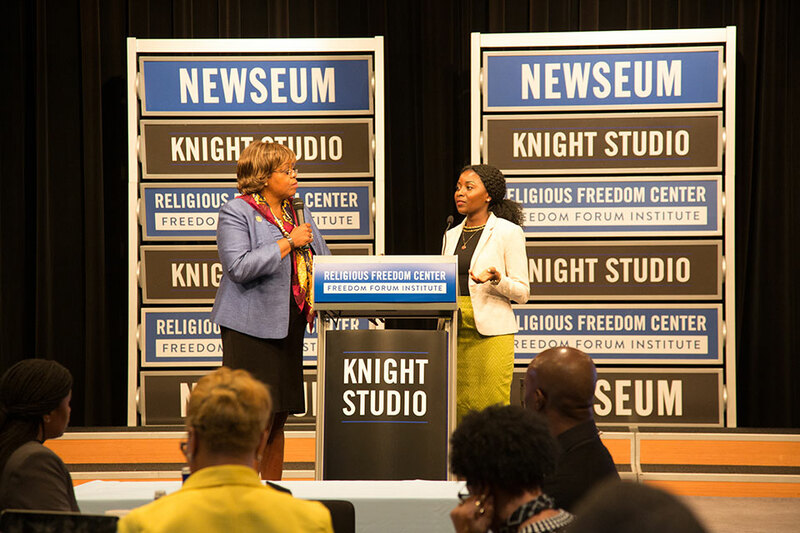 The course, supported by the Religious Freedom Center of the Freedom Forum Institute, serves as catalyst to promoting understanding and dialogue on this very important topic through the lens of oppressed communities. Read more about students’ experiences in the article written by Adelle Banks with the Religion News Service. Dr. Sabrina Dent is director of programs and partnerships at the Religious Freedom Center of the Freedom Forum Institute. Her email address is: sdent@freedomforum.org. This entry was posted in News and tagged Henry Luce Foundation, religious freedom, Samuel DeWitt Proctor School of Theology of Virginia Union University by Religious Freedom Center. Bookmark the permalink. This was an excellent forum and we learned a great deal regarding the important tenets of religious freedom. Outstanding instructors and this will truly bless the masses as we return with a determined mindset to make a difference through assuring religious freedom for all.